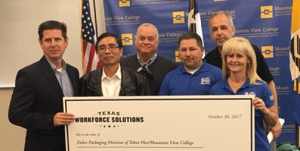 Wayne, Pa. (November 29, 2017) —The 150 employees of Dolco Packaging in Dallas will benefit from a Skills Development Fund training grant from the Texas Workforce Commission (TWC) that will be administered through Mountain View College. Dolco, a Tekni-Plex business unit, manufactures polystyrene foam egg cartons, foodservice packaging and foam packaging for light bulb tubes at this location. The grant will be used to provide customized training for manufacturing-related skills such as circuits, control systems, welding, tooling and mold maintenance. Trainees will include electronic technicians, material handlers, production operators and warehouse personnel. “In support of Tekni-Plex corporate objectives, Dolco Packaging is dedicated to creating an environment where our employees are continuously learning and growing. We are also committed to providing the highest quality products to our customers. This skills grant will help support those objectives,” said Marcus Hawn, plant manager, Dolco. Dolco Packaging identified the training needs at its Dallas location and partnered with Mountain View College to develop curricula and conduct training. The Skills Development Fund pays for the training and the college administers the grant. To further support its growing manufacturing requirements, Dolco is currently looking to add packers, machine operators, forklift operators and maintenance technicians to its Dallas facility. Dolco Packaging is the leading manufacturer of polystyrene foam and PET containers for the egg, agricultural, food and food service markets. With five manufacturing facilities across the United States, Dolco is the number one supplier of foam egg cartons domestically. For more information visit www.tekni-plex.com/dolco.